The increased 50,000 mile bonus offer for the Lufthansa Miles & More® Premier World MasterCard® is currently one of the best airline credit card offers on the market. You’ll earn 50,000 bonus miles after spending $5,000 within 90 days, and after meeting the spending requirement you will have enough miles for a round trip ticket to Europe from the US or two round trip flights within the continental US. In my opinion this is a great offer considering it will get you a round trip award flight to Europe, if you end up grabbing this card be sure to read up on how to maximize your miles with this series! If you haven’t heard of Miles & More, it’s okay, since all of the airlines in the program are based out of Europe. The program includes Lufthansa, Austrian Airlines, LOT Polish Airlines, Swiss Air Lines, Adria Airways, Croatia Airlines, Luxair, Brussels Airlines, and Germanwings. With Miles & More miles you have access to much more award space within the program to choose from–especially so on Lufthansa, LOT, and Swiss–since the program saves a certain amount of award space for its own frequent flyers. 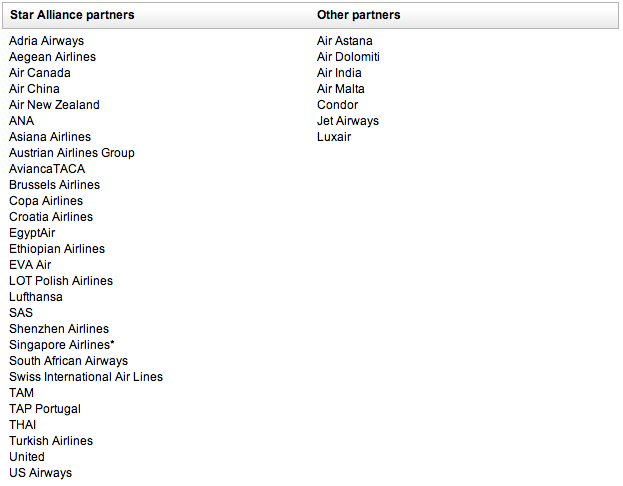 This also means having Lufthansa Miles & More miles will get you much better access to award flights on these airlines. If you are thinking about booking award travel to Europe, it will be much easier to get premium award space on these airlines using Lufthansa miles than say, using United miles. On my recent trip to Croatia I ran into this and could not book a premium award because Lufthansa First Class and Swiss First Class award space is not released until two weeks prior to the flight. On top of that partner awards in Business and First Class were increased dramatically with United’s recent devaluation. The interesting part is that you can easily book premium awards the other way around, meaning you can use your Lufthansa miles to book on United or any of the 26 Star Alliance partners. By being part of Miles & More you get access to a handful of airline partners outside of Star Alliance, these include Air Astana, Air Dolomiti, Air India, Air Malta, Condor, Jet Airways, and Luxair. Using these partners to book awards can potentially open up more unique destinations or routing options. Miles & More also allows you to pay for the taxes and fees on some award flights using miles. From what I can tell, there is a flat rate of 18,000 miles per award, but the terms specify that it can only be done on European flights. Miles & More® Premier World MasterCard® holders have the benefit of having no mile expiration date just as long as they have been a Miles & More Credit Cardholder for at least 3 months and make one purchase per month. If you are not a Miles & More credit cardholder, then your miles expire 3 years from the date accrued on a quarterly basis. For example, miles earned through December 2014, will expire December 31, 2017. One exception is that Elite-level member miles will not expire as long as they remain Elite-level members. There are also a few new changes to the Miles & More program that went into effect in January 2014. With the exception of First Class awards, Lufthansa offers very fair (sometime better) priced awards and a very competitive award chart. US based members can get from the US to Europe for 50,000 miles with a roundtrip economy award booking on Lufthansa, SWISS or Austrian. For comparison, that is 10,000 miles cheaper than a roundtrip economy award to Europe using United miles. On the other hand, in Business Class you will have to pay 105,000 and 170,000 in First Class. Again for comparison’s sake, booking a United Business Class roundtrip would cost 100,000, and 135,000 for a roundtrip First Class award. If you want to book premium awards using Miles & More miles, you will pay a little more, but you will get excellent award space availability on both Lufthansa and Swiss. One of the sweet spots on Lufthansa’s award chart is actually flying domestically within the US. You can book a domestic roundtrip award for 25,000 miles in Economy, 35,000 in Business and 50,000 in First Class. Since domestic flights within the US will be on United, 35,000 miles is a steal for a roundtrip flight in Business. One of the best values is using 35,000 miles to book a fully flat-bed on United Business Class premium service flights from JFK to SFO or LAX. You will have more than enough miles for 3 one-way domestic Business Class award tickets after you complete the $5,000 minimum spending requirement. Given that a cross-country Business class ticket on United can cost upwards of $1500, you can get a huge value out of this sign-up bonus. You can book one-way awards for half the miles of the normal roundtrip cost. An interesting part to this is that when you book one-ways, the award will always round down to the next 1,000 mile interval. For example, if you are booking a roundtrip domestic flight in the US using two one-way awards, the two award tickets would cost 24,000 instead of booking a roundtrip award at 25,000 miles. Often times you can save 1,000 mile here and there by booking two separate one-way awards instead of one roundtrip. Small savings, but worth it for very little hassle. One-way awards can also be booked on an any Miles & More partners and includes a stopover. Award travel for children ages 2-11 can be booked for 75% of the normal award rate. This can make booking awards for a young family a huge value. Say if you are booking a trip to Europe for a family of 4 with two young kids, you can potentially save 25,000 miles. The drawback is that child awards cannot be booked online and are only available on flights by Adria Airways, Austrian Airlines Group, Air Dolomiti, Brussels Airlines, Croatia Airlines, Germanwings, LOT Polish Airlines, Lufthansa, Luxair and SWISS. One incredible perk of Miles & More is their reduced priced Mileage Bargains awards. You can book awards to select destinations at huge savings (50% off). This rotating list of discounted award travel flights can get you a roundtrip economy award to Europe for 30,000 miles and a roundtrip business award for 55,000 miles. If you can find a flight that works for your trip, this will allow you to get a huge value out of your miles. Book awards at a 50% discount!